Morris & Yeomans was a needle manufacturer based in Redditch from 1870. As well as needles, they produced accessories and sewing-related souvenirs. This pretty needle case is based on a traditional hexagonal quilt block, often used by quilters as a pattern for a needle case or pin cushion. 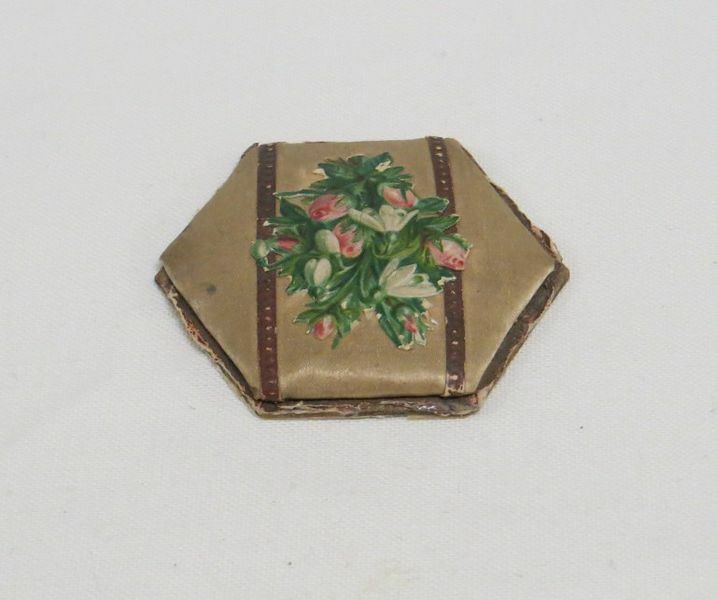 It is decorated with decoupage flowers, and does not seem to have been used. 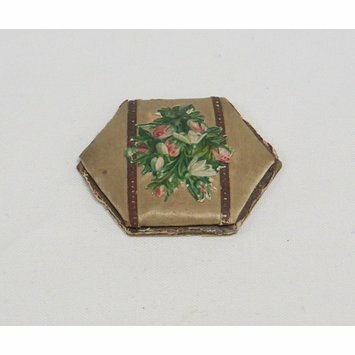 This object was owned by Eileen Brock (born 1915), a keen seamstress in her childhood. Gold coloured fabric over padding, mounted onto a thick card hexagon. The top of the needle case is embellished with paper cut outs of brown strips and a bouquet of pink and white flowers. The back of the needle case features the manufacturer's name and name of the product in blue, yellow and red. Belonged to the donor as a child.